After you are met by your guide at your hotel, you take a ride through pretty country side, south of Prague to the castle. After about 2 hours we reach the Hluboka Castle, located outside of a small town with the same name, not far from the famous brewery town of Ceske Budejovice (Budweis). Hluboka Castle history: the original royal castle was built by Přemysl Otakar II, the founder of Budweis, in the second half of the 13th century. It was rebuilt at the end of the 16th century by the Lords of Hradec. It received its present appearance under Count Jan Adam of Schwarzenberg. According to the English Windsor example, architects F. Beer and F. Deworetzky built a Romantic Neo-Gothic chateau, surrounded by a large English park here in the years 1841 to 1871. There is a winter garden and riding-hall where the Southern Bohemian gallery exhibitions have been housed since 1956. Note - this is one of the castles (except for the Prague Castle) that can be visited in the Czech Republic in the winter. The other is Rozmberk. Karlstejn Castle and Konopiste can we visited in the winter on weekends only. The castle has been used in a scene of Jackie Chan and Owen Wilson's 'Shanghai Knights'. 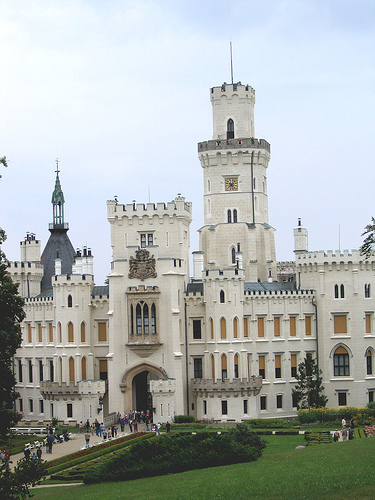 After visiting the castle, which takes about 1 hour, we drive to the town of Budweis. Here it's time for lunch (not included - your guide will make suggestions) and after, take a walking tour of the old section of Budweis (Ceske Budejovice) with your guide. If you like, you can visit the famous brewery on your way out of town. Budweis history: The town was founded by Hirzo, a knight of King Přemysl Otakar II of Bohemia, and was granted its charter as a city in 1265. It has long been connected with beer brewing, however has a very attractive, barock center Square. The largest brewery is Pivovar Budějovický Budvar, which has legal rights to market its beer under the "Budweiser" brand name in much of Europe. The same product is also sold elsewhere under the names "Budvar" and "Czechvar" due to legal squabbles with Anheuser-Busch over the Budweiser brand. The American lager was originally brewed as an imitation of the famous Czech original but over time has developed its own identity and attained remarkable commercial success. Anheuser-Busch has made offers to buy out the Czech brewing company in order to secure global rights to the name "Budweiser", but the Czech government has refused all such offers, considering keeping the Budweiser name Czech to be a matter of national pride. The second largest brewery, Pivovar Samson, also does a fair amount of export, mostly under the "Samson" and "Crystal" labels as well as "B. B. Bügerbräu". Duration: approximately 10 hours with the brewery visit. Hluboka Castle is closed on Mondays.